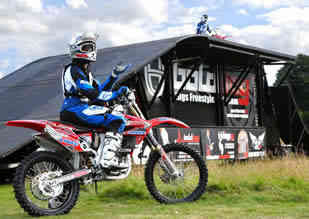 Daniel Whitby the first man in the UK to flip a 4 stroke in The UK will be heading to Margam Park bringing with them the aweome sound of the Honda 250f, along with fellow Bolddog team members Samson Eaton , Arron Powley and Ben Peters. As Honda’s official and the UK’s number one motorcycle display team, the Bolddog Lings team travel all around Europe and the UK and have the world’s largest and most sophisticated mobile landing system. The Bolddog riders have all the latest heart stopping tricks as usually only seen on TV. The team set the standard 12 years ago and now continues to push the boundaries of FMX and lead the way for all motorcycle display teams and will be looking for top spot finishes At the Big Air Jam.